Recruiting is always constrained — by money, competition, expectations. But the chief constraint is usually time. It’s difficult to get everything done, particularly when the labor pool is shrinking, the skills gap is growing, and talent is as scarce as hen’s teeth. Maria Hardeman and Perry Monaco feel your pain and are here to help. They are both customer success managers at LinkedIn who help our customers use LinkedIn Recruiter to effectively find the right hires. Needless to say, they have a lot of tips — and they brought those tips to their breakout session at Talent Connect 2018. Our research shows that 58% of the people who follow your Company Page on LinkedIn want to work for you (the rest are current employees, alumni, and others, including some who simply love your products or services). Your followers are also 95% more likely to accept an InMail message from you and 81% more likely to respond. 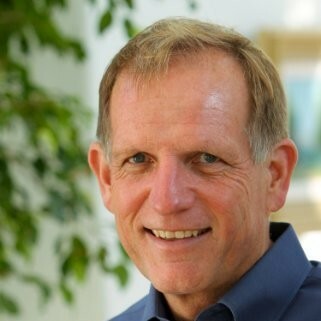 Perry told the audience that when he runs a search to hire someone for his team at LinkedIn, he filters the results to capture the people who are already following the company. Bonus tip: Keep your followers engaged by using Talent Updates to share everything from company blog posts to employee videos, recruiting events to industry thought leadership. And do it all from your Recruiter seat. To avoid these frustrations, you can now create a project in Recruiter for each role you need to fill and then search within that project for best results. You can effortlessly switch between your search (Talent Pool) and your pipeline. With a single click, you can save your best candidates to the project or hide candidates who are not a good match for a specific job. Finally, when you return to a project, you’ll be able to pick up exactly where you left off. Before you ever promote someone, Perry said, there’s one thing you have to do: “Make sure they have a nice, robust, full, and complete LinkedIn profile.” Then, he said, you can leverage that profile to clone this star performer by using the Similar Profiles function. Once you’ve done that, you’re going to be able to see other customer success managers who have backgrounds, experiences, and skills similar to the person you’re promoting. Maria says there’s a lot of speculation about the ideal time to send out InMail messages — 9 a.m. on Monday? 5 p.m. on Friday? What’s the magic moment? 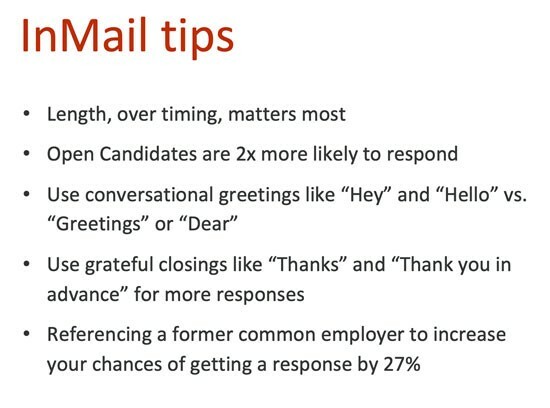 “The best time to send an InMail message,” she said, “is the minute you find the candidate.” We did a detailed analysis and the timing of your messages doesn’t really affect the response rate. And don’t bury the hook. Tell them why you’re reaching out. Perry noted that job descriptions are critically important. They fuel the algorithms that are searching for the best candidates and filling your sourcing pipeline. So when you’re drafting a job description avoid acronyms, abbreviations, industry jargon, and company-specific names and phrases. In order to get a diverse mix of candidates, you also need to make sure your descriptions are inclusive. To do this, avoid using gender-coded words — such as ninja, rock star, guru —in your job titles. Replace them with straightforward titles such as sales rep or software engineer or project manager. You should also avoid masculine-oriented words — including active, analytical, decisive, independent — in the sections on qualifications and responsibilities. According to one study, three-quarters of the candidates who start to apply for a job never finish. That’s a huge pool of talent standing at the gateway to your career site. 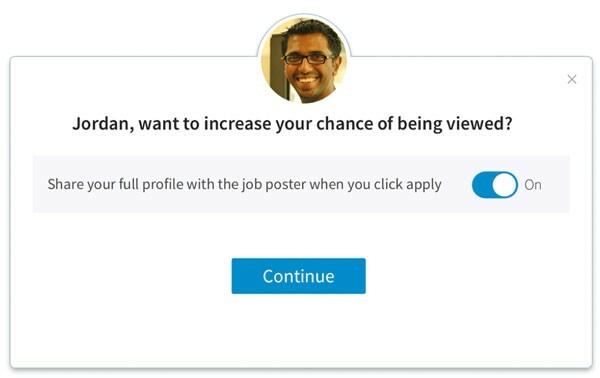 The Apply Starter feature on Recruiter allows job seekers to share their LinkedIn profile with you before they begin their application. 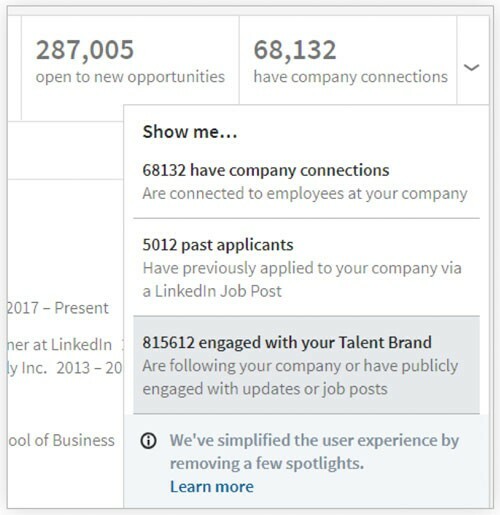 They simply click on a button that says, “Share your full profile with the job poster when you click apply.” Ultimately, this lets you find them using the Past Applicants Spotlight. Bonus tip: You can also look back at similar jobs that you’ve posted previously and search through the Apply Starters candidates. This allows you to start looking at candidates as soon as you begin a new search. 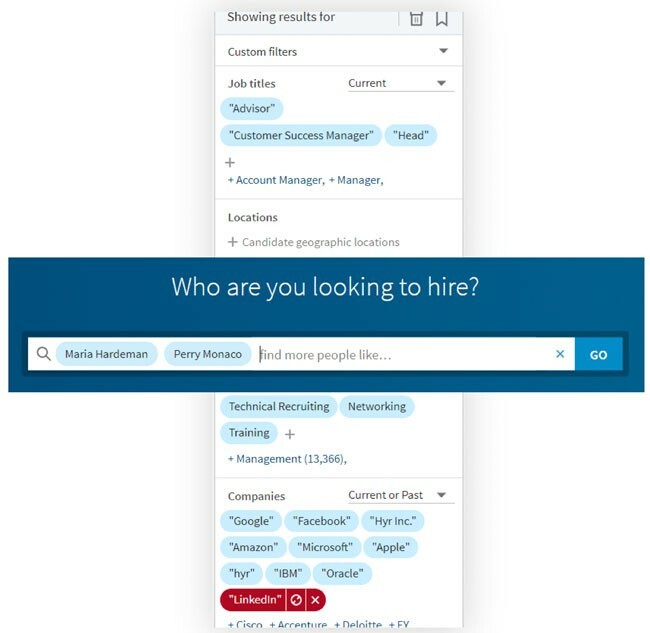 The Search Insights feature on Recruiter lets you quickly visualize, analyze, and interpret data about various pools of talent. “You’re not just some robot,” Maria said, “who churns out candidates and reads resumes all day and talks to people on the phone.” You’re an insightful analyst who can help build your company quickly and effectively by identifying best-available candidates. In his intake meetings, Perry comes armed with his laptop and asks hiring managers what they’re looking for. He then runs a live search, entering titles, skills, and locations, and shows them the data. 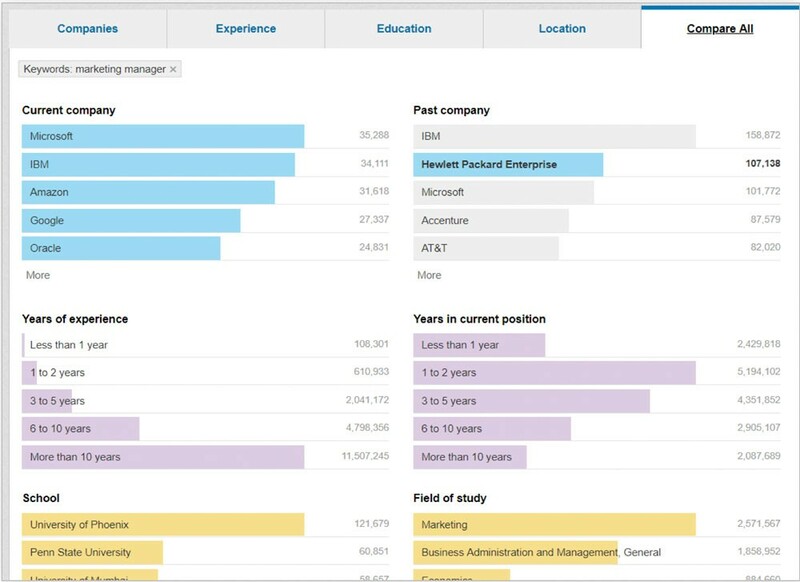 Search Insights reveals the talent pool’s current and past employers, typical years of experience, location, and education. 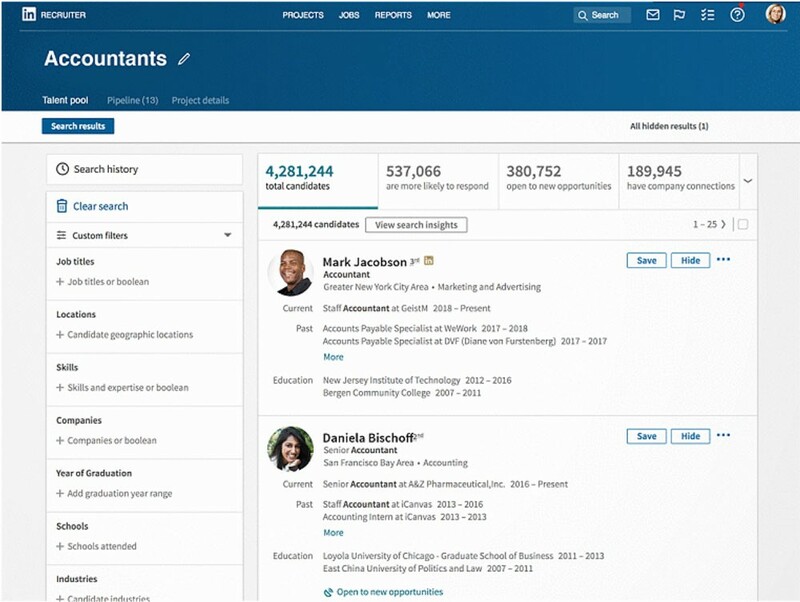 In turn, Perry can show the hiring manager how the talent pool changes as he adds colleges, expands the geography, or reduces the required experience. Leverage all seven of these tips and hiring managers will start to see you for what you’ve been all along: a true business partner.